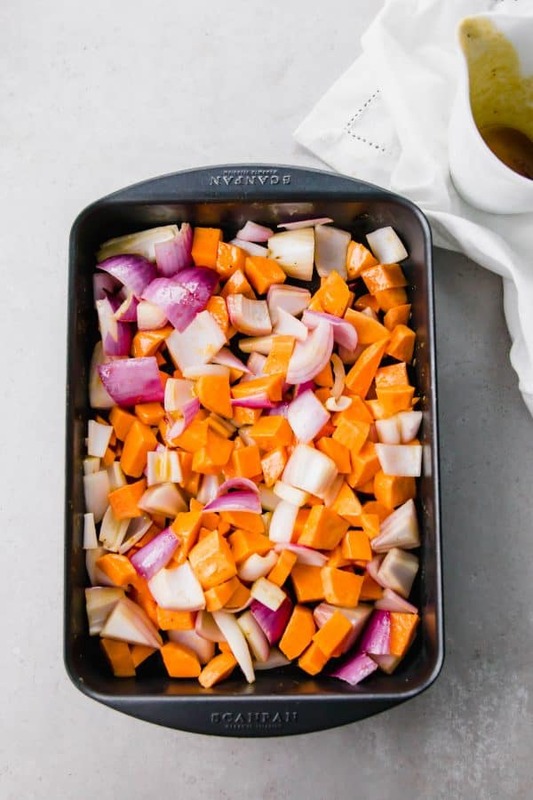 These maple mustard roasted sweet potatoes and shallots are sure to be the star of any dinner and are a cinch to make. 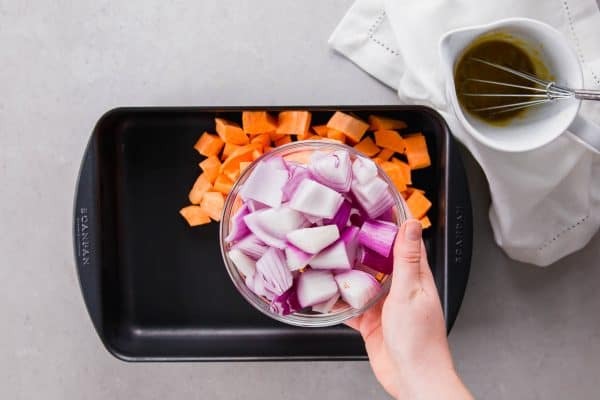 You can also use red onions (or really any type of onion!). You’ll be eating these like candy! I hope you guys aren’t sick of roasted vegetables yet, because I could keep them coming at you all fall and winter long. 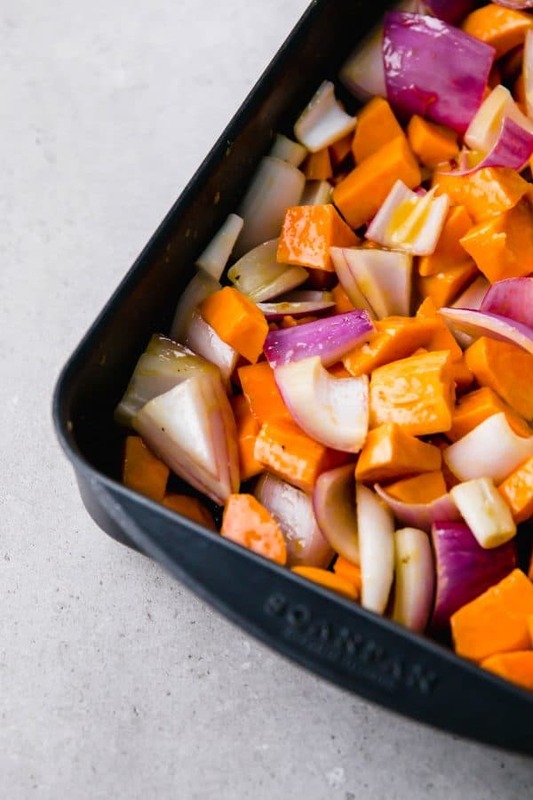 There is not much better than putting in a tray of veggies and coming out with caramelized, flavorful goodness. I like roasted vegetables almost as much as popcorn. No wait, I didn’t just say that. But I do love them. A lot. 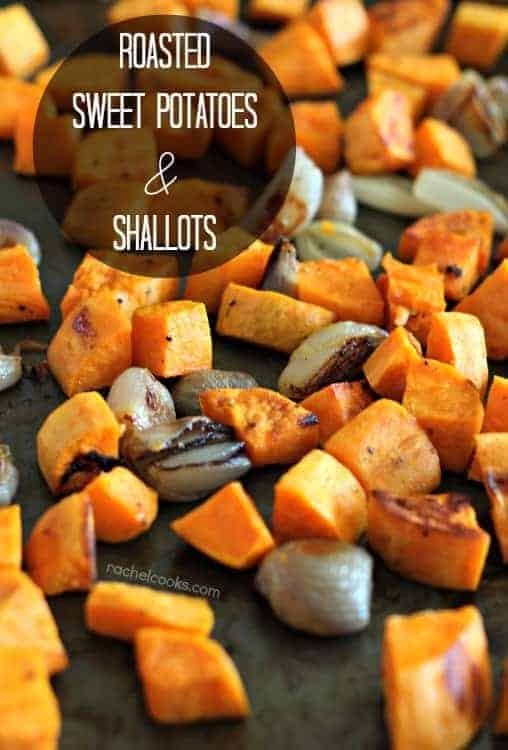 These sweet potatoes and shallots are no exception. I’d eat them year-round except turning my oven on this high in August would make it 108 degrees in my house. Give or take. These just so happen to be perfect for Thanksgiving, too. Is it too early to talk about that? It is the day after Halloween, so in blog world I think that means Thanksgiving recipes? I can barely keep up most days with getting a post up here, must less having it be what it is “supposed” to be. I’m so glad you all still stick around. If you could see me now, I’d hope you would still stick around. Nothing like my Stitch Fix photos taken after church. Now? Greasy hair, yoga pants. But writing this post comes first, then I’ll shower. Really, I swear. I will. I have friends coming over for a play date tomorrow so I don’t really have a choice but to be at least clean. The yoga pants may or may not still be present. I can’t be held accountable for that. I am very excited to be making this pumpkin macaroni and cheese for my friends. I haven’t stopped thinking about it since Erin posted it. But now I’m getting distracted again because I can’t stop thinking about this macaroni and cheese. It has BACON and caramelized onions, two of my favorite things. 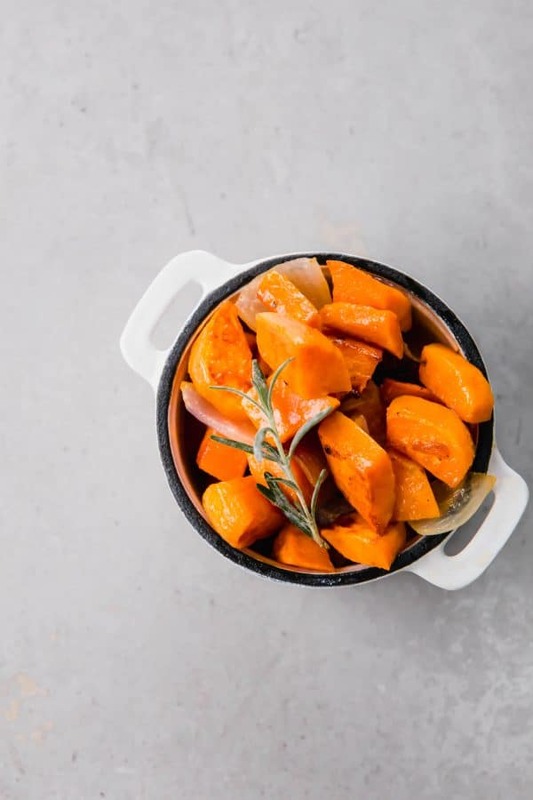 These roasted sweet potatoes combine some of my favorite fall flavors. Sweet potatoes, obviously. Sweet, flavorful shallots. The roasting juice. That sounds gross, let’s go with…liquid…is comprised of maple syrup, Dijon mustard, and obviously some olive oil. The Dijon gives it that nice punch of flavor and the maple syrup cools things down a bit so they don’t get too spicy from the mustard and adds a nice sweet contrast to the savory flavors. Q: How Long Does it Take to Roast Sweet Potato Cubes? A: It depends. Helpful, right? It depends on how small you dice the cubes. The smaller they are, the faster they cook. The larger they are, the longer they take. If you cut them in approximately 1-inch cubes, you can plan on them taking 25-30 minutes when the oven is set to 425°F. Q: How do you Cook Sweet Potatoes in the Oven? A: Obviously, there are multiple ways to do this, but to roast them, follow the recipe below and you’ll love the result! Q: How do I make Crispy Sweet Potatoes? Oh goodness, I feel ya! The crispier, the better. There are a few ways to get extra crispy roasted sweet potatoes – it’s the same way you get crispy roasted potatoes. I like to soak the potatoes in water for at least 30 minutes (after dicing). When you take them out of the water, dry, dry, DRY! Water = steam = soggy = not crispy = sadness. You’ll also want to use a high oven heat. This recipe calls for 425°F but sometimes I even do 450°F. I don’t recommend 450°F for this particular recipe because the maple syrup will burn. The last way to get crispy roasted sweet potatoes is to not turn them too often. Let the oven do its thing before you start moving stuff around. And don’t be afraid of brown! Brown = crispy = delicious! 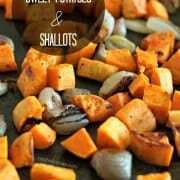 Watch this short video to see how to make these roasted sweet potatoes! 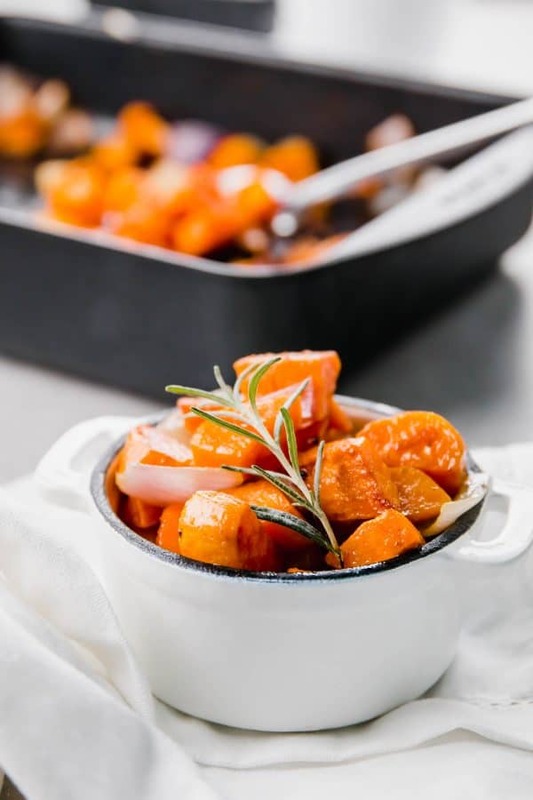 These maple mustard roasted sweet potatoes and shallots are sure to be the star of any dinner and are a cinch to make. In a small bowl, whisk together olive oil, mustard, maple syrup and salt and pepper. 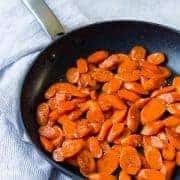 On a large rimmed baking sheet, toss sweet potatoes and shallots with this maple mustard mixture until everything is well coated (I use my hands). Roast for 15 minutes, stir, and continue cooking for another 10 minutes or until vegetables are browned and cooked through. Serve immediately. Verdict: Loved the spiciness of the Dijon mustard with the sweetness of the shallots and maple syrup. Husband’s take: No complaints from him! 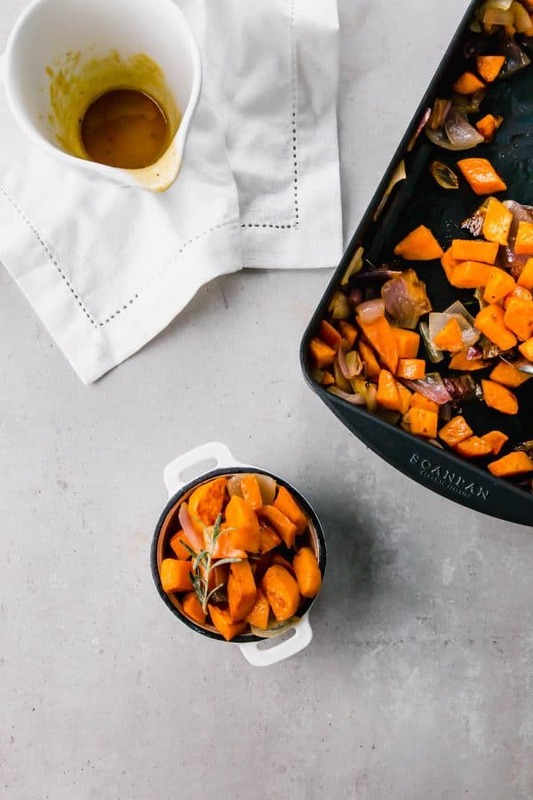 If you’re obsessed with roasting vegetables like I am, make sure you check out my roasted broccoli, roasted cauliflower, spicy sweet butternut squash and roasted carrots with thyme and nutmeg (and that only scratches the surface!). This post updated with new photos January, 2018. Check out the old ones below! Good recipe. My only alteration (hat tip Serious Eats) was to parboil the sweet potatoes for a few minutes. It draws out their sweetness. 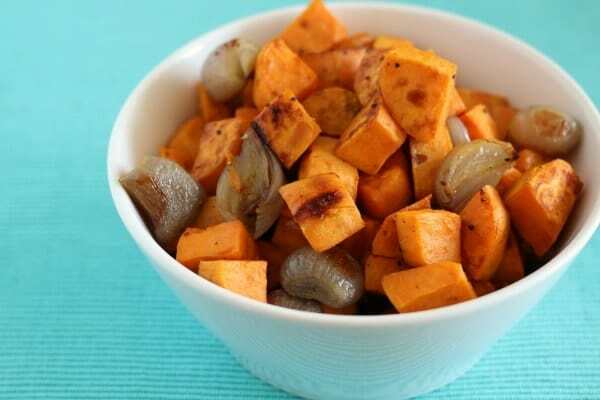 Roasted sweet potatoes sounds amazing! Can’t wait to give it a try! 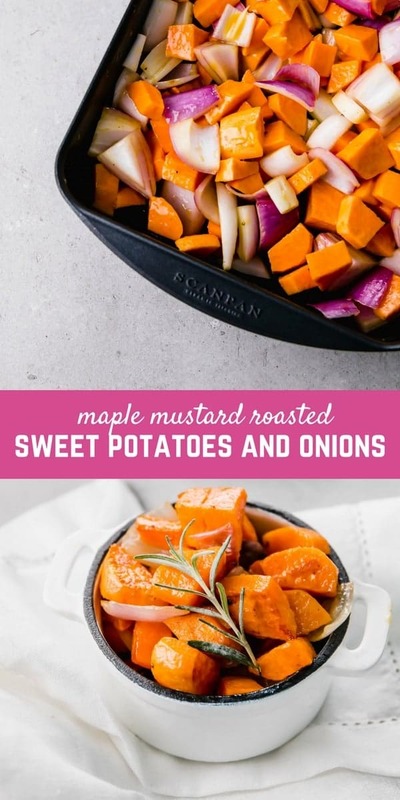 Love roasted veggies and the maple and mustard flavor sounds delicious. I will never be sick of roasted vegetables. Especially sweet potatoes! These look great. Holy cow. You are killing me with these!! I need to make these ASAP. Roasted onions are the best! I’m already thinking about Thanksgiving recipes too and this looks fabulous! Sounds and looks great! 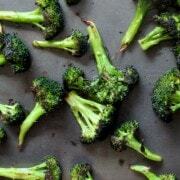 I’ll definitely have to give these a try as the last tray of roasted veggies burned…oops. 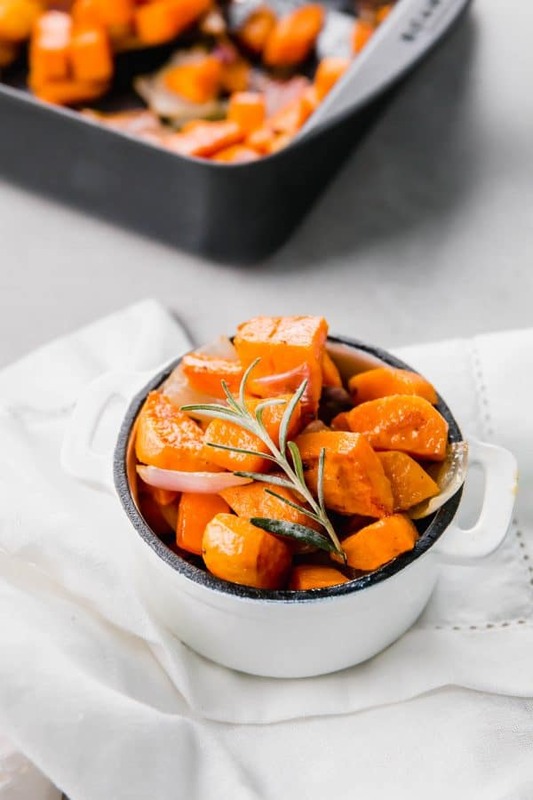 LOVE this idea for cooking sweet potatoes – definitely giving it a try soon since I make sweet potatoes no less than 3 times a week! I’m totally intrigued by the maple and mustard combo! Mmm. I love sweet potatoes. They look perfect! Thanks for the mac and cheese shout out Rachel! Totally makes my day :) Hope you and your friends love it, and you should totally keep the yoga pants on. #1) Yoga pants are total mac n cheese attire. #2) It’s Friday. #3) Your friends will love you no matter what you are wearing! We loved it! I made some adaptations (although I’m sure they weren’t needed, I just have a problem with following recipes) and I might post it as well! Everyone loved it. And I wore skinny jeans. I don’t think you’d be a true food blogger if you were able to resist adaptations, lol. I’m much the same way. Mac and Cheese AND skinny jeans? You are really getting the best of both worlds! I’m so happy to hear that you all enjoyed it. 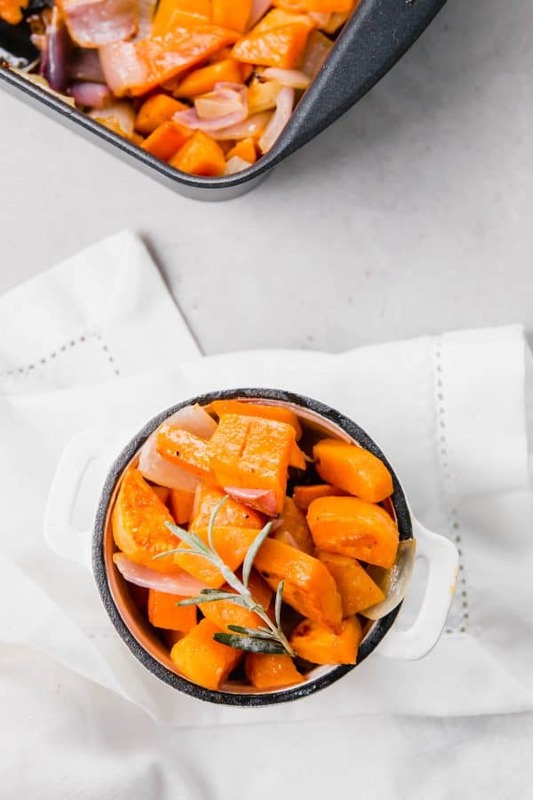 I could eat roasted vegetables every day of the year. Add an onion (or anything like an onion) and I’m even happier. These look first-rate!